This movie location is on the wrong side of the tracks. C'mon. That's a pretty obvious clue. Your guesses? That's Andie's (Molly Ringwald) house from Pretty In Pink. I have to admit, I didn't even need the picture. The clue was too easy. COME ON! Sure, it's easy to flame the OP for his easy clues, but it's even EASIER to hide behind an "Anonymous" handle! I'm calling you out, good sir! 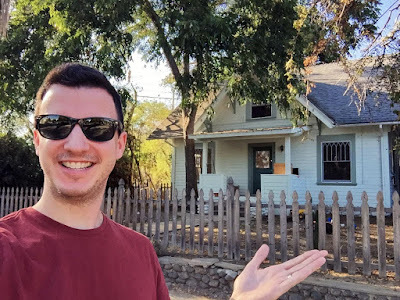 Regardless, yes, you're right -- this is Andie Walsh's (Molly Ringwald) house on "the wrong side of the tracks" from Pretty in Pink (1986), located on Hope Street in South Pasadena, CA. I'll be sure to make next week's clue harder. HAPPY? Now it's time to find Amanda Jones' house from SKOW.